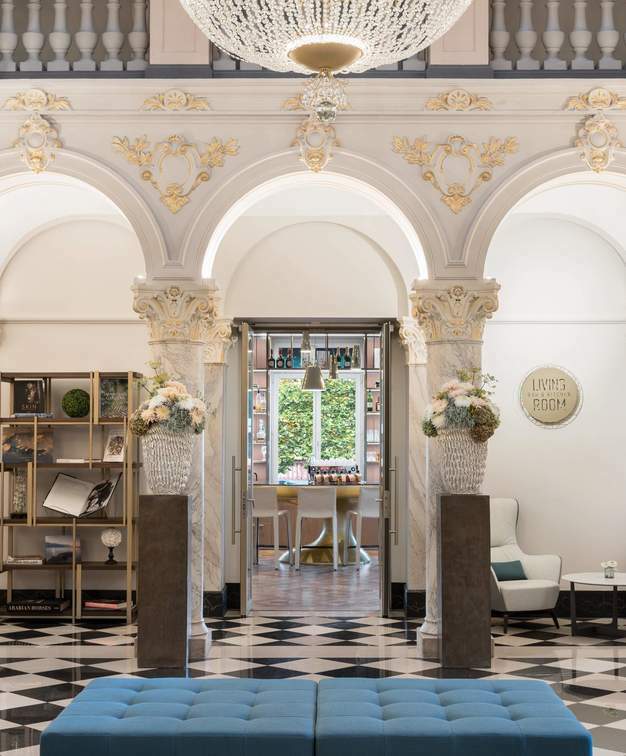 With the picture-perfect Mont Blanc as it’s backdrop, this chic hotel has over 150-years of history and was a personal favourite of Grace Kelly. A five-minute walk from the city’s most upscale business and shopping arteries, this prestigious property on the shore of Lake Geneva has been recently renovated, intertwining its historic elements with an uber elegant contemporary design the apex of which is the stunning lobby with black and white checkered floor and oppulant hanging chandelier. With 74 bedrooms and a regal suite, the hotel also boasts a trendy high-end restaurant, a Scandinavian inspired eatery, a fitness center, and a state of the art meeting room and business centre. 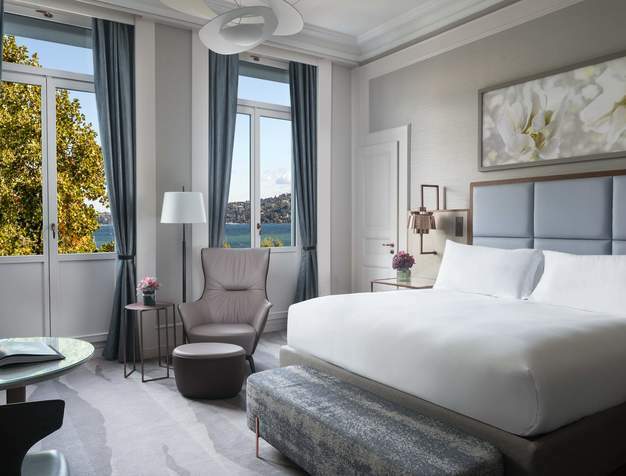 All 75 bedrooms, recently redecorated are elegantly and tastefuly decirated with floor to ceiling windows, featuring balconies and fireplaces and offering guests a bespoke experience. "We expected the best at the Ritz and we got it. The location was wonderful -- on the lake and in the middle of things. The room was new, flawless and had a full-on lake view." 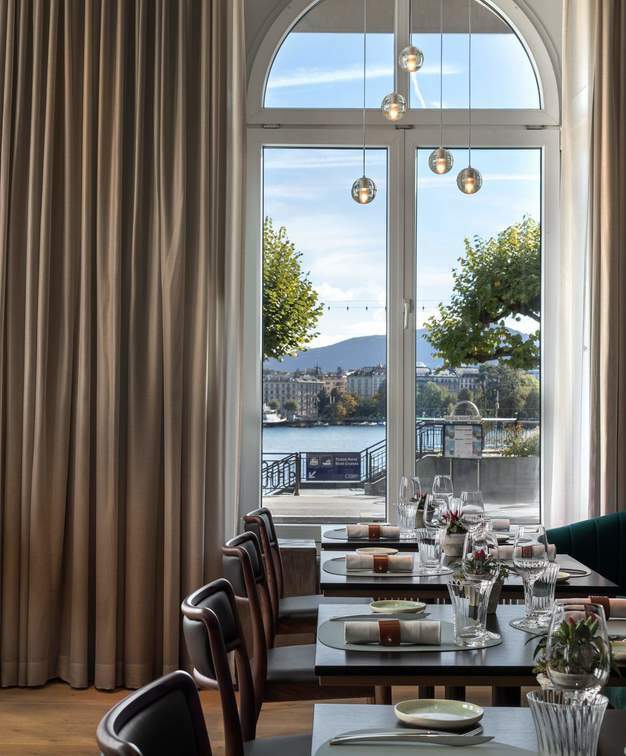 Combining elegant architecture with state-of-the-art technology, The Ritz-Carlton Hotel de la Paix, Geneva meeting venue, Rive, is an adaptable space enhanced by natural light through floor-to-ceiling windows and inspiring garden views. Located on the ground floor, the multifunctional room can be hired as one space to accommodate 100 guests or ingeniously divided into two chic areas. 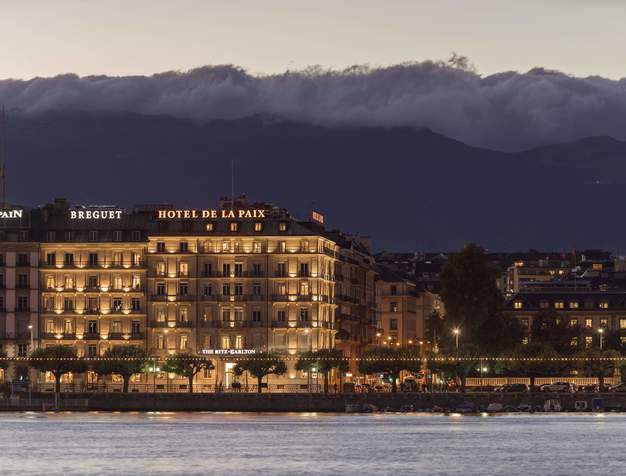 The Ritz Carlton Hotel de La Paix has two restaurants run by the famous Italian Chef Alessio Corda - the cozy and sleek LIVING ROOM BAR & KITCHEN with an incredible waterfront view which is open all day serving seasonal, healthy recipes for breakfast, lunch and dinner. The trendy FISKBAR, with a minimalist natural décor serves outstanding Nordic fusion cuisine. The Ritz Carlton Hotel de La Paix also features one fitness centre with the latest equipment for your daily work-outs.